The distinction of collecting, preserving and exhibiting artifacts relating to the experience of Ukrainian Catholics in Manitoba is what sets St. Volodymyr Museum apart from the rest. Primary focus has been placed on collecting material relating to the Ukrainian Catholic experience in Canada. It continues to maintain its small Ukrainian ethnographical section collected by Ukrainian Catholic Women's League members traveling cross-country to meetings and conventions during the late 1960s and early 1970s. St. Volodymyr Museum was started as a Canadian Centennial project in 1967 by the Ukrainian Catholic Women's League of Canada in Winnipeg. The project was blessed by His Grace, the late Most Reverend Archbishop M. Hermaniuk, Metropolitan of Canada, who himself donated many artifacts. The museum, originally located at 418 Aberdeen Avenue in Winnipeg (previous 'Progress' newspaper headquarters) was moved to Blessed Virgin Mary Parish hall in 1985 for added safety and in preparation for the upcoming Centenary of Ukrainians in Canada in 1991. It remained at BVM parish till 1998 when then Auxiliary Bishop Stefan Soroka advised that the collection be moved to the newly renovated Archbishop's Chancery at 233 Scotia in Winnipeg. St. Volodymyr Museum presently finds itself in an environmentally controlled space including storage, workroom, and exhibit areas. Most appropriately it is situated adjacent to the Chancery library and archive which only enhances its location. 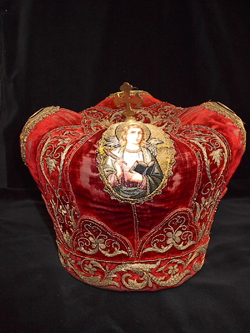 The collection is extraordinary - featuring bishops' and priests' vestments, many liturgical items from chalices to hand crosses, icons, church linens, banners etc. Of particular beauty are the growing number of tabernacles and gospel books. A major feature of the museum is a diorama of a rural, Ukrainian Catholic Church c. 1920 which showcases a cross-representation of the collection. St. Volodymyr Museum, although small in size and very specialized in its mandate, strives to meet and maintain museum standards set by the Canadian Museums Association and Canadian Conservation Institute. Together with the support of the Ukrainian Catholic Foundation of Manitoba, the Ukrainian Catholic Women's League of Canada (Manitoba Branch) and His Grace, the Most Reverend Archbishop Lawrence Huculak, Metropolitan of Canada, the museum staff and volunteers invite you to visit and witness the development of this most important endeavor. Is situated at the Archbishop's Chancery on Scotia Avenue, on land purchased in 1929 by Bishop Vasyl Ladyka? Collects, preserves, interprets and exhibits Ukrainian Catholic material? Strives to preserve the stories of the Ukrainian Catholic people? Exhibits the vestments and other personal items used by Blessed Bishop Vasyl Velychkovsky (on permanent loan to the Bishop Velychkovsky Martyr's Shrine at St. Joseph's Ukrainian Catholic Church in Winnipeg)? Exhibits the vestments of two previous Ukrainian Catholic Bishops in Canada, Bishop Vasyl Ladyka and Blessed Martyr & Bishop Nykyta Budka? The year 2012 marked the 100th anniversary of Blessed Bishop Nykyta Budka's arrival in Canada. Exhibits the spoon used by Blessed Bishop Nicholas Charnetsky to secretly administer Holy Communion while in the labour camps? Includes in its collection a growing number of tabernacles from Ukrainian Catholic Churches all over the province? The museum has, in fact, initiated a 'save the tabernacles' campaign to encourage museums to preserve their tabernacles and other liturgical items no longer used. Museum tours are offered by appointment. Please call ahead to make arrangements for your visit. Free-will donations in lieu of set admission fees are most appreciated. One main feature of St. Volodymyr Museum is an exhibit entitled, 'Remembrance, Celebration, Gratitude' which was created for the 2012 Synod of Ukrainian Catholic Hierarchs, held in Winnipeg. Five exhibit panels cover a span of a century (1912-2012) in celebration of 100 years since the arrival of Canada's first Ukrainian Catholic Bishop, Blessed Nykyta Budka, Bishop and Martyr. To view the panels, click here or the ‘mitre' of Blessed Nykyta Budka. A Ukrainian translation is available for the main storyline of the exhibit (three center panels) click here. 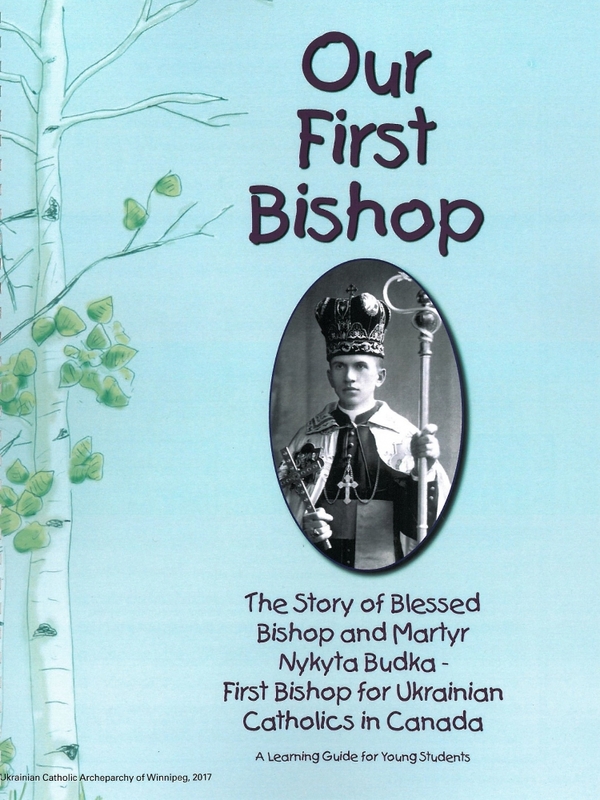 "Our First Bishop" - The Story of Blessed Bishop and Martyr Nykyta Budka - First Bishop for Ukrainian Catholics in Canada' is a learning guide for young students. It introduces readers to the world of Ukrainian Catholic leaders at a time when Canada was itself taking shape as a nation. Students will gain a broader understanding of how the story of ‘Our First Bishop' fits into the broader scheme of history, while making connections to modern times. The reader will discover who Nykyta Budka was as a young boy, how he came to be a bishop, what he did in Canada and ultimately, how he came to be called Blessed. The storyline itself is complemented with historical photographs and artifacts. A variety of teaching graphics will help link many historical themes to children's lives today. In addition, a ‘Words to Know' feature will help understand specific vocabulary pertinent to the story. Catechists will appreciate the 'What is a Holy Relic?' and 'Steps to Sainthood' features. The guide was designed to be used as an entire teaching unit, or in parts as independent mini-lessons. Although suited best to grades 5 to 8, there are many components of the guide that can be utilized independently to suit younger grades. 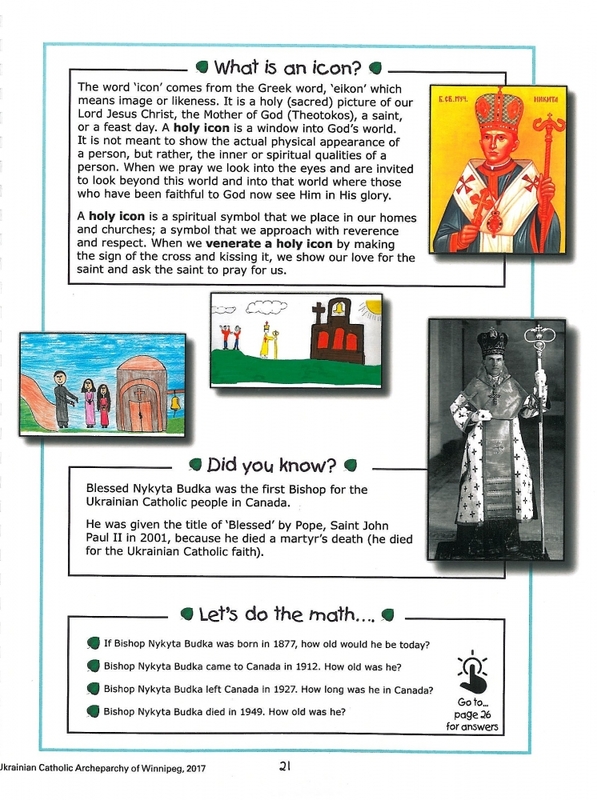 Kindergarten and Grade One educators, for example, may choose the icon coloring page to introduce Blessed Nykyta to their students. Grade Three Level might choose to focus on the Coat of Arms. For Catholic schools, there are numerous opportunities to link some of the activities such as, ‘Look at the Photograph', with the school curriculum. In addition, there are a variety of activities (maze, word search, crossword puzzle etc.) to engage the student and to bring some fun into learning. PLEASE KEEP IN MIND THAT REPRODUCING ANY OR ALL CONTENT MUST BE FOR CLASSROOM USE (EDUCATIONAL PURPOSES) ONLY. Entire document OR individual pages may be selected. The project was funded by a grant from the Catholic Foundation of Manitoba.